It seems volatility is here to stay in 2018 and it’s coming from multiple areas. This time around, President Trump’s announcement to put $50 Billion tariffs on Chinese goods sent the S&P 500 into dizzy last week, falling 5%, rebounding 2% yesterday, and giving it back today. In fact, today marks the fourth consecutive trading day the S&P 500 has closed at +2% / -2%. Just how unusual is this? According to Bespoke, the last time this happened was August 2011! Just a couple of weeks ago, we were all wondering just how long the market would go up with little to no volatility to be seen. 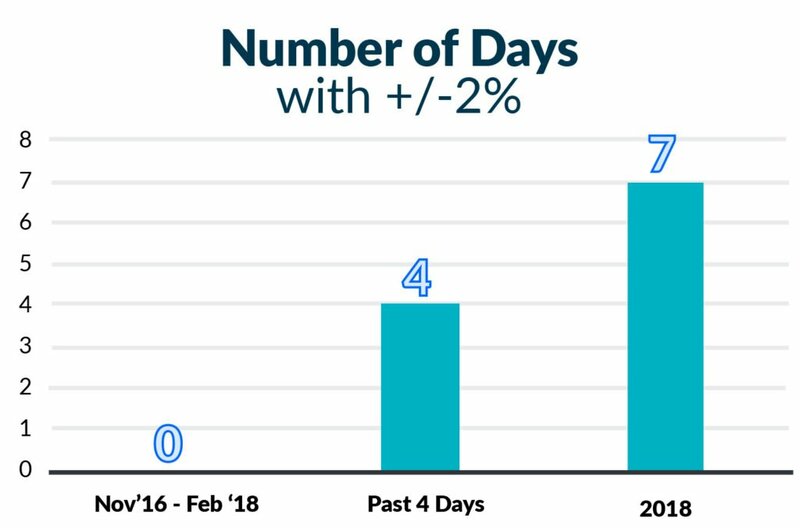 Now, we’ve seen four straight days of markets moving +/-2%, adding up to 7 days of 2% moves in 2018! Before February 2018, we hadn’t seen a +/ 2% day in the S&P since Nov’16! President Trump’s tariffs may have kicked off the volatility, but it doesn’t seem to be a one news cycle story in the markets. Volatility is here to stay. The question is, where will the volatility take us? New highs – or further into a correction?